A beautiful flask, stainless steel, 8 ounces, with a smooth solid black leather wrap. 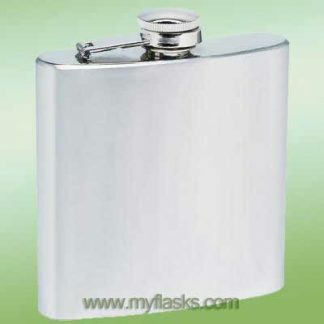 This flask provides approximately 5 shots of your favorite spirit in a sleek, stylish container. The screw-down cap and polished finish on top and bottom. Measures 3-5/8″ x 6-1/4″ x 1-1/4″. Limited lifetime warranty. Retail boxed. This flask is wrapped with genuine cow leather. Care should be taken when cleaning after use. Interesting post you got there. I always love products as they last long and could be good gifts for all celebrations. They also look very classy and definitely looks great for males and females too! Thanks for sharing and keep it up. I want to report this is very good flask. Wow I can’t believe how cool this flask looks and feels. Perfect for carrying some Jack discreetly.